Help ensure your company's information is ITAR, EAR and DFARS compliant. If you’re a service provider to the U.S. federal government – whether to civilian agencies or the Department of Defense (DoD) – your information systems must meet requirements as specified in the Federal Acquisition Regulation (FAR) or, more specifically the Defense Federal Acquisition Regulation Supplement (DFARS). You may also need to comply with the requirements of the International Traffic in Arms Regulations (ITAR) or the Export Administration Regulations (EAR). Violating ITAR puts you at serious risk for both civil and criminal penalties, being barred from future exports and even imprisonment. 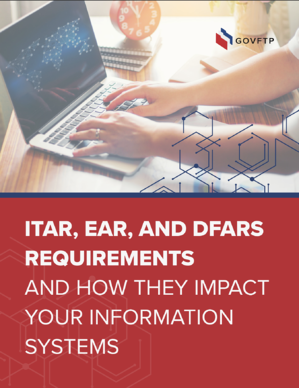 To help ensure your company’s information is ITAR, EAR and DFARS compliant, we put together a guidelines document that walks you through their requirements and how they impact your information systems. Simply fill out the form to access your free copy.